Hi Milo! Happy Dog of the Day! What a handsome Schnauzer x you are, Milo! Love your coloring, your wavy coat, that smile!!! And you have every reason to smile, having been rescued by your wonderful human, living the good life there in beautiful Stephenville, TX! Rescues truly are the best, and you are living proof of that, Milo! But just who rescued who? What a serendipitous gift of unconditional love and healing, comfort and joy your human was blessed with the day she/he welcomed you home! Losing a furkid is so very painful we sometimes think we can never love another again. But thanks to you your human is smiling again, her/his heart healing! I can't help but believe that your beloved predecessor, Rollie, had a paw in leading your mom/dad to you that fateful day, that it was destined to be that you and she/he would be as one! What a very special bond of love and devotion you and your human have forged, Milo! How lucky she/he is, having been chosen to be your one and only, having a best friend, a furry family member as beautiful, as smart, as loyal and loving as you! As the saying goes, sometimes the best things in life come along when we least expect them! You truly are a treasure, Milo, just as special as can be, simply the best! Thanks for the BIG smiles, Milo! Reading your happy homecoming story, seeing all of your heart-melting photos, has been a real treat! Hope you enjoy a very special day of celebration, sweetheart...playing fetch and tug o war; taking a run with your human and tonight, sharing some chill time on the couch watching TV; being loved and pampered to pieces! 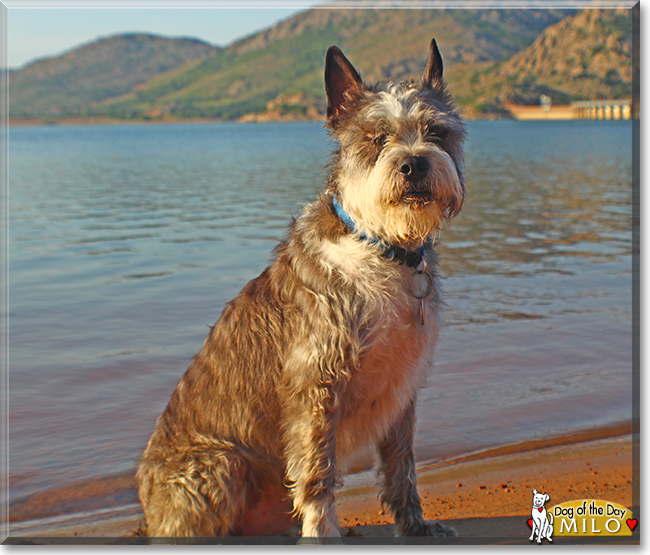 Lots of love, hugs and smooches to you, precious Milo, our very special and most deserving Dog of the Day, EVERY day! How anyone could abandon you, is beyond me. Fortunately you found the perfect home. Milo is extremely cute! He sounds like a fun little duffer and wonderful company to boot! Lovely DOTD!! 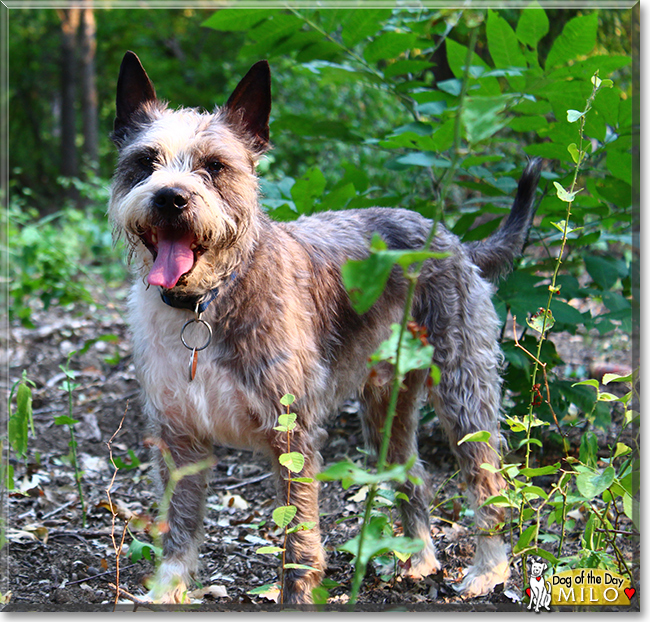 Congratulations, handsome Milo on being today's Dog of the Day!